During this Easter season, I thought it would be the perfect time to visit the world of Peter Rabbit and find out about the author who wrote these charming and classic children’s books. 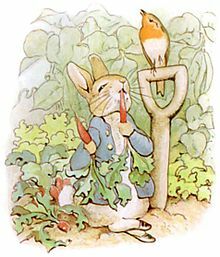 Helen Beatrix Potter (Born: July 28, 1866 Died: December 22, 1943) was an English author and illustrator, her first book “The Tale of Peter Rabbit” was first published in 1902. She continued to write a series of books featuring such delightful characters as Benjamin Bunny, Jemima Puddle-Duck and Squirrel Nutkin. Beatrix also drew the beautiful illustrations for her stories which featured the lovely English counrtyside where these small animal friends lived. Beatrix was born into a wealthy and privileged family and her father was a barrister in London. They lived in South Kensington and spent their summers in Scotland or the Lake District in England. Beatrix and her brother were naturally curious children and had such a love of nature that they would keep a variety of small animals and spent their time studying, drawing and painting watercolors of them. Beatrix and her brother were raised by a governess named Annie Moore and after she left their employment to get married, she remained friends with Beatrix throughout their lives. Beatrix and Annie kept in touch over the years, writing letters and sometimes Beatrix would enclose stories for Annie’s children that she would illustrate with amusing drawings. In 1893, one of those stories was to Annie’s son, Noel, and it was a charming tale about four little rabbits named Flopsy, Mopsy, Cottontail and Peter. Annie suggested that Beatrix’s stories would make wonderful children books. In 1901, when Beatrix was unable to find a buyer for her stories, she decided to print them at her own expense for family and friends. The London publishing house of Warne & Co. was eager to compete in the lucrative children’s book market and they decided to publish Beatrix’s story of Peter Rabbit. In 1902 “The Tale Peter Rabbit” was published and became an immediate success. The popularity of Beatrix’s books is credited to her enchanting and imaginative animal stories set in the beautiful rural English countryside and charmingly illustrated. Beatrix wrote and illustrated two to three of these little books every year eventually writing a total of twenty-three books. Working closely with Norman Warne, her editor, over the course of following years the two became friends and then they fell in love. In 1905, they were secretly engaged despite the disapproval of her parents but sadly Norman suddenly died a few months later. Beatrix continued to work with the Warne & Co. until her final book was published after World War I. With the proceeds from her books and a small inheritance from an aunt, Beatrix bought Hill Top Farm in the Lake District in 1905. She made many improvements to the property, learned new farming techniques and began raising livestock. She continued to purchase additional farms hoping to preserve the unique country landscape that she loved. In 1913, she married William Heelis, a respected solicitor in the area. Beatrix and Heelis were married thirty years, they had no children, but Heelis came from a large family and they enjoyed their nieces and nephews. Through the years they continued farming, raising their prized Herwick sheep and more importantly their preservation efforts. Beatrix also continued to write her stories and to draw, mostly for her own pleasure, until her failing eyesight made it too difficult. She died from complications of pneumonia and heart disease in 1943 at Castle Cottage. She left almost all her property, including over 4,000 acres of land, sixteen farms and several cottages to the National Trust. Beatrix Potter’s lasting legacy are the stories of Peter Rabbit and his friends. Her children’s books have continued to sell throughout the world and are printed in several different languages. She left most of the original illustrations for her books to the National Trust and the copyrights to her stories and merchandise were given to Warne & Co. 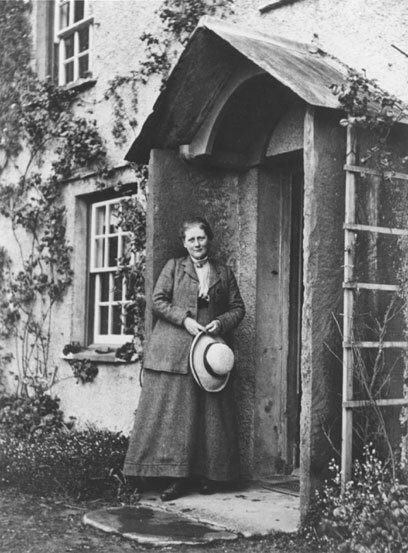 Her beloved Hill Top Farm was opened to the public by the National Trust in 1946; her artwork was displayed there until 1985 when it was moved to Heelis’s former law offices in Hawkshead, now known as the Beatrix Potter Gallery. “The Tale of Peter Rabbit” was published commercially in October 1902, with a print run of 8000. Each book cost one shilling each. To mark the 110th anniversary of the publication of The Tale of Peter Rabbit, Frederick Warne & Co. commissioned British actress Emma Thompson to write “The Further Tale of Peter Rabbit”, in which Peter ends up in Scotland after accidentally hitching a ride on Mr. and Mrs. McGregor’s wagon. The book was released on September 18, 2012. The 2006 movie, “Miss Potter”, stars Renee Zellweger in the title role with Ewan Mcgregor as her publisher, Norman Warne. The movie tells the story about the life of Beatrix Potter and charmingly incorporates animated characters from her children’s books.